For hotel teams, content marketing is more important now than ever before. Over the past decade, brands from nearly every industry have incorporated some level of content marketing into a broader marketing approach – from farming, to fashion, to finance – and with good reason. The crafting and sharing social posts, videos, blogs and like online content is key to driving brand awareness in the digital age. At its essence, this content marketing “trend” really isn’t trendy at all, but simply an update to an age-old marketing approach: storytelling. In the uber-competitive travel industry, every hotel has a unique story to tell, and digital platforms such as Instagram, Facebook, YouTube, Twitter and Pinterest offer an audience of literally billions. For hotel teams, however, this digital storytelling has to be more than beautiful and memorable. It also must be actionable. All content must aim to drive users to a property’s app or website and aid in generating direct bookings, but just because a post doesn’t immediately result in a room night doesn’t mean that content lacks value. Beyond driving direct bookings, there are multiple reasons content marketing matters more now than ever before. Booking a room at an unfamiliar property is a leap of faith. Travelers long to feel confident they’ve made a good choice when they click. Third-part reviews and website photos only offer so much insight. Does the property provide all of the amenities they desire? Is it safe? Can they easily get from the property to their meeting, dinner reservations or local attraction? Content marketing affords hotel teams an opportunity to tell its unique story and educate potential guests. By sharing helpful information and answering common questions, without asking for anything in return, hotel brands build trust with travels, and when it comes time for those travelers to choose a hotel, the brand that informed and educated them will be top of mind. The sharable aspect of social media is one twist that makes content marketing unique. 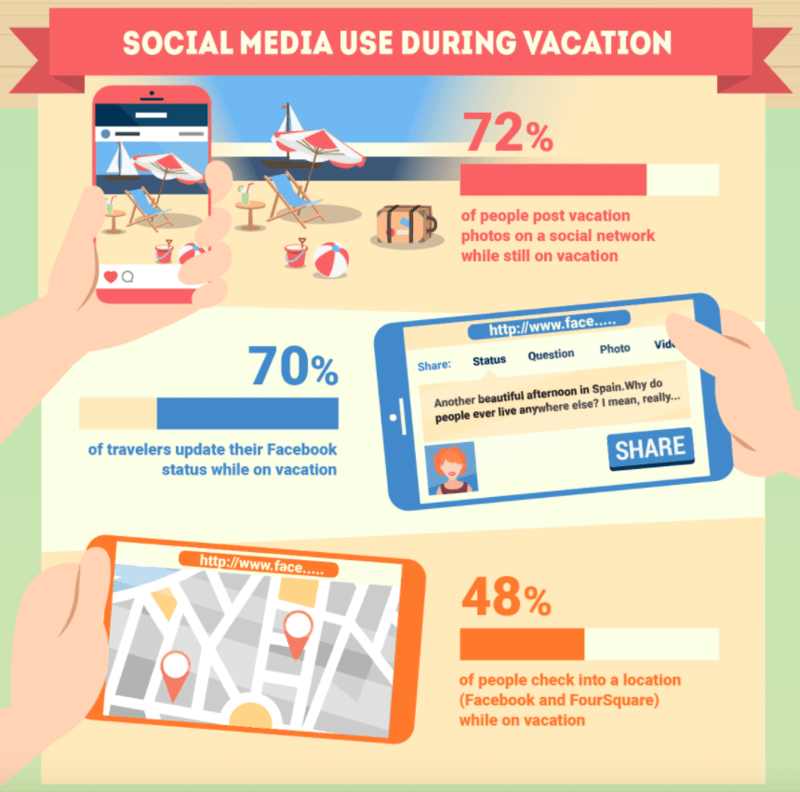 Roughly three out of four travelers post vacation photos on a social network while still on vacation and, in a recent study, 60% of people say such user-generated content (UGC) is the most influential content they reference when planning travel. Generating original content is critical for driving brand engagement, as well, especially to younger travelers. Nearly three out of four Millennials say they check the company’s social media feed before booking, and a third say they would likely skip booking altogether if a hotel had no social media presence. Bottom line, informative, quality content kicks open the doors of opportunity, and greater brand exposure generates increased awareness and inquiries. Not every hotel query comes in via phone or email. Travelers are increasingly comfortable interacting with a hotel’s social content by posing questions as comments attached to brand posts. A hotel’s shared photo of a local attraction might invite a user to ask “How far is from your hotel?” After a social post sparks initial interest, users are often motivated to reach out via social channels to more critically evaluate a property’s aptitude. Is your hotel pet friendly? Is massage available on site? Responding to these comments, direct messages and other digital inquiries facilitate direct bookings because people feel confident patronizing a property that invites interaction and shows a commitment to customer service. Even with the pervasiveness of social media, most travelers still head to Google to find for a hotel. While the world’s most popular search engine has an ever-shifting algorithm that dictates where a page appears in search results, content marketing is key to appearing prominently in organic results. Google loves fresh content. Websites that regularly share new articles, new videos, new photos and new blog posts achieve higher rankings than sites that do not. It’s a SEO “best practice” that absolutely every hotel should adopt. Frequent content also means rankings under a broader variety of long-tail keywords, again driving increased traffic direct to a property’s website. When creating any piece of travel content, it is important to know why you are creating it and on what channels you will promote it. Successful hotel content marketing takes a consistent commitment and an understanding of how people interact with various types of content on different channels, but when done right, few marketing strategies are as productive or cost effective. For smaller properties with less experience in content marketing, don’t feel overwhelmed. Partnering with a trusted digital marketing partner experienced in content strategy can be a savvy move to be sure your hotel’s storytelling is selling.